Baylies - New York NY Amazing! "I bought this jacket after trying on a couple in stores. I am 5’8 with long arms and the 46 fits perfectly. It came in perfect condition and shipped insanely fast. The perforated version is still very strong leather, but breathes better for summer weather. The jacket is stuff with the protection padding but I can kind of still tie it around my waist if I try hard & am too lazy to carry it (as it is a little heavy). I am so beyond thrilled for the price as well. My boyfriend got the men’s version of the jacket a couple of months ago, in stores for $500+. He was jealous when I got mine. Overall extremely satisfied with this purchase." Sydney - Seattle, WA Solid Jacket "This jacket is the first motorcycle jacket I have purchased. I am 5'5" and 125 lbs. I got a size 44, but probably could have gone with a 46 for layering. Like the previous review stated, the arms are snug. 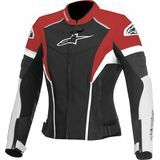 I bought this in hopes to wear a sweatshirt underneath for some cold weather riding, but its definitely a tight fit. On its own, the jacket is perfect. I know come spring and summer it'll be great once it has had the chance to break in. If you are planning to wear any other layers underneath I suggest sizing up. The padding sits well in the elbows and shoulders. And the leather is very durable. Good quality jacket all the way around. 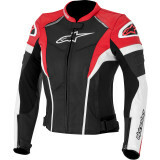 Doesn't cut in real tight at the hips like most womens riding gear either which is nice!"